Happy Monday, friends! 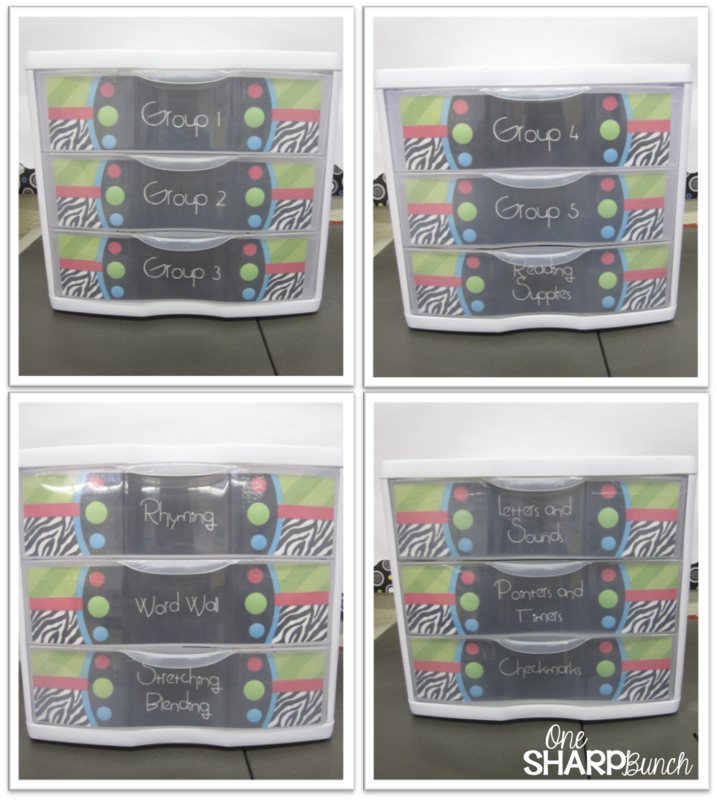 I’m linking up with Tara from 4th Grade Frolics to share with you how I labeled my Sterilite drawers. Sorry for the terrible glare on this picture! Please remember to link back to Tara’s Monday Made It post to check out what other creative teachers have been up to this summer! This Monday Made It was pinspired! I saw all of these wonderful drawers that said Grade, Copy, File. I LOVED them, but wanted to fancy up my drawers I use for guided reading. These drawers sit on a shelf behind my guided reading table and hold all of the books and forms for each group, as well as various word work and reading supplies. Again, sorry for the glare! I searched and searched and SEARCHED for a template. I was positive that some fabulous teacher had already created a template that I could use, and just when I was about to give up and make my own, I stumbled across The Tattooed Teacher’s post. I was beyond thrilled! Sweet, sweet, sweet Rachel provided the traditional Grade, Copy, File options in three different designs, as well as a blank template for each design, all in a PowerPoint file! YIPPY! 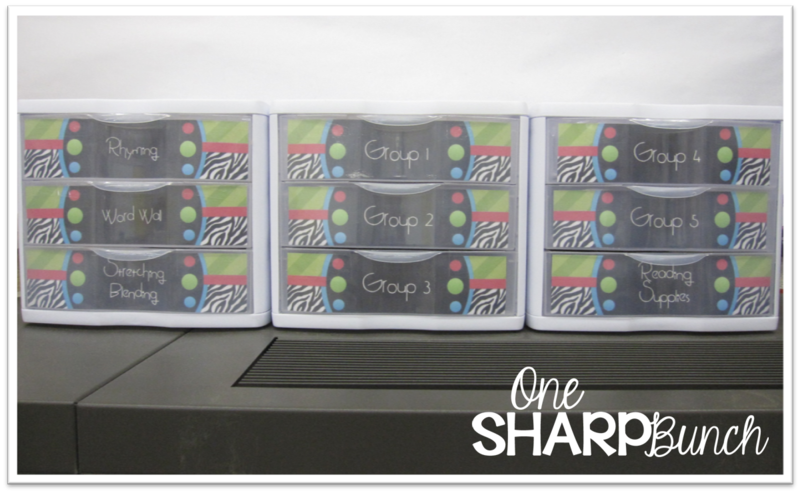 All I had to do was insert a text box on top of the design and PRESTO… customized drawer labels! Then, I printed, laminated and cut to size! Easy peasy! At first, I was going to Mod Podge the labels to the inside of each drawer. I tried one drawer, but quickly realized that the laminate was preventing the Mod Podge from drying. SOOOO…. I resorted to packing tape. I taped all along the inside on the top and bottom of the drawer. I even wedged some tape into each corner, which was a tad tricky! These drawers are a teacher’s dream! They not only hide all of my guided reading materials, but keep them within hands’ reach! I. LOVE. THEM. Plus, they match my new color scheme in my classroom! 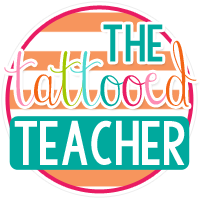 Now, hurry over to The Tattooed Teacher’s blog to download a copy of the file! Click on the picture or here to see The Tattooed Teacher’s post! Thank you again, Rachel, for the fabulous freebie! Here’s my question for all of you . . . how do you store your guided reading supplies? Hi Kristen! You can never have enough sterlite drawers! I have at least ten different kinds, small, tall, three drawer. Seriously! Thank you, Kristen! I love the labels that Rachel made! Can't wait to see how you organize yours! I love color! Wait to you see all my purchases! Wait! You probably have on instagram! Thanks for hosting this linky! Congrats on over 100 link ups! Right now I use colored trays that match up with each group's color, but they definitely don't hide the clutter as well as your drawers. I may need to change up my guided reading storage. Thanks for the link to Rachel's template for the drawers. The year before last, I used tubs. I just switched to drawers last year to hide the clutter and love them. Now, I love them even more with Rachel's snazzy labels! Love those drawers! I just wrote a blog post about ones that I made for papers that I need to copy, grade, and file. Thanks for the extra ideas! PS I think I am your newest follower! Hi Gina! I love drawers for almost everything! The are great for hiding stuff! 🙂 Thank you for following me! I love how yours turned out. Thanks for the link to get the templates, too! Thank you, Carol! I was so happy when I found that template, so I quickly emailed Rachel to make sure she didn't mind me blogging about them. Enjoy! They look awesome! Yeah, I have a love/hate relationship with Mod Podge! Mod Podge was not my friend that day! I've used it in the past, but the plastic drawer, laminate and Mod Podge do not mix! I have 5 of these drawers (although mine have a black frame). I have tried a bunch of different labels and haven't found any that fit perfect and I couldn't figure out a way to attach them. Hopefully I can use these drawer labels and use clear packing tape! Never thought about laminating them first! 🙂 Thanks for sharing!!! My coworker used the label with the black polka dots on the bottom with black drawers, and they look AWESOME! You will need to do some trimming, a little on the sides and top and bottom. Just measure the length and height of your drawer, and you should be all set!